BHW432 is a remarkable survivor. Built in 1935 for Bristol Tramways and delivered in the tramway blue livery, the bus was rebodied by ECW in 1947 and the more typically Bristol Omnibus "Tilling Green" livery applied. 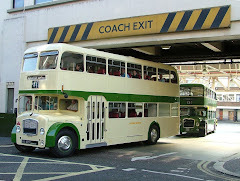 After retirement from passenger use in 1958, BHW432 became a showman's bus but after being laid up for several years (and already 59 years old), the bus was acquired by Simon Harris & Kevin Scrivens in 1994, operators of vintage fairgrounds. Fitted with a generator to power rides and a large storage area to the rear, BHW432 took on a new life with the travelling fairground which includes an unusual set of chair rides. By 2009, BHW was getting rather delicate both mechanically and structure. The BusWorks has been commissioned to fully overhaul the bus and this has involved sourcing many rare mechanical parts and not inconsiderable time and expense. The next major phase is stripping down the ECW body - a 63 year old body on a 75-year old chassis. 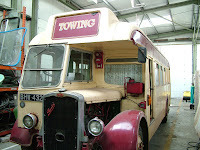 See http://www.vintagefunfairs.com/galleries/bristol-bus-bhw-432/#viewgallery for more details.